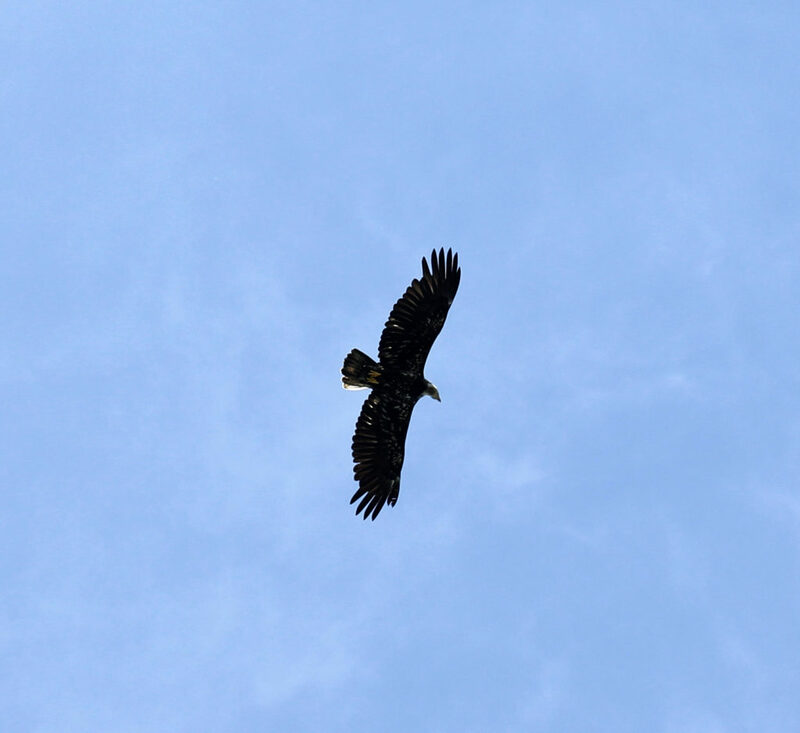 Gliding over the beaches below, the eagle scans the rocks for signs of remaining fish carcasses. 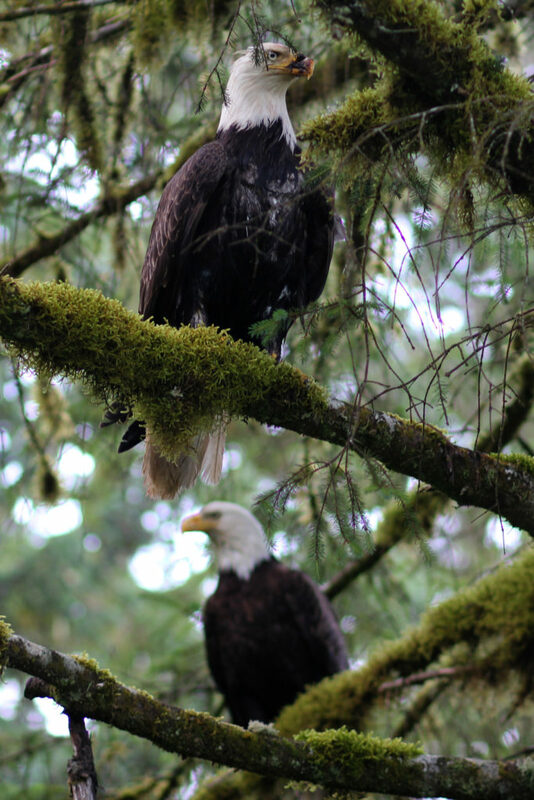 An eagle couple sits in the trees, surveying the area surrounding the river. 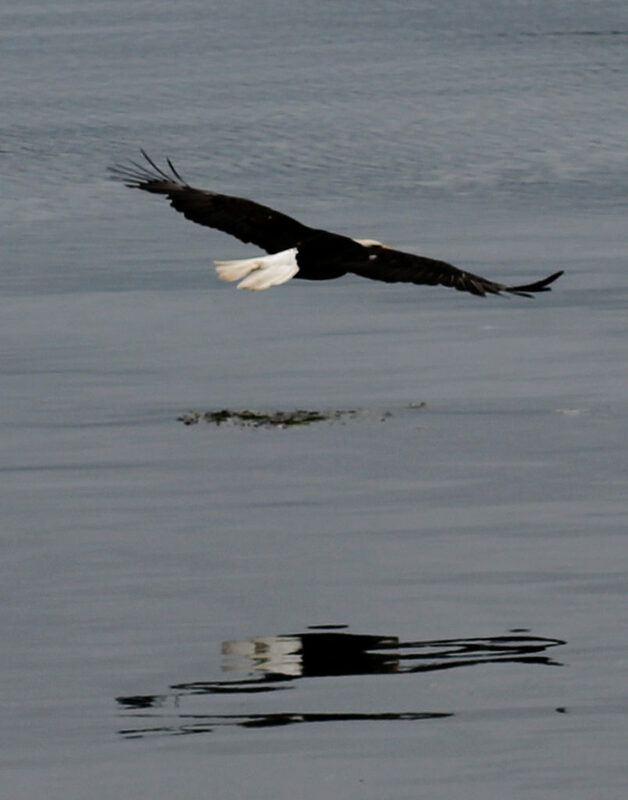 The eagle swoops low over the bay, its reflection visible against the glassy surface of the water. 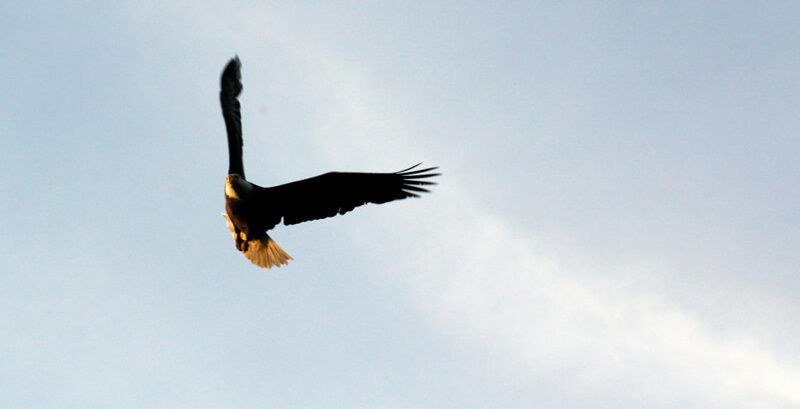 An eagle, channeling its inner Batman, swoops overhead. 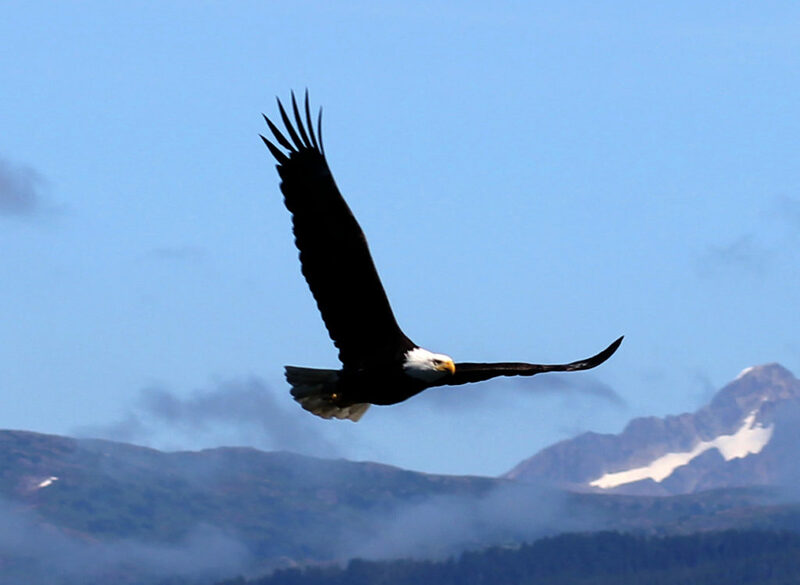 The eagle flies in a curve against the backdrop of a blue summer sky. 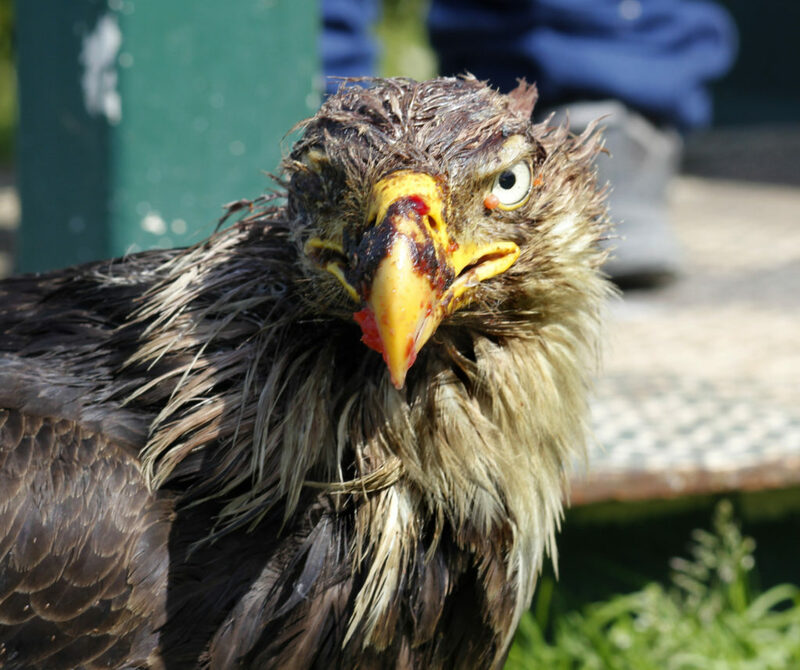 An injured eagle waits at the local fish cleaning station for food. 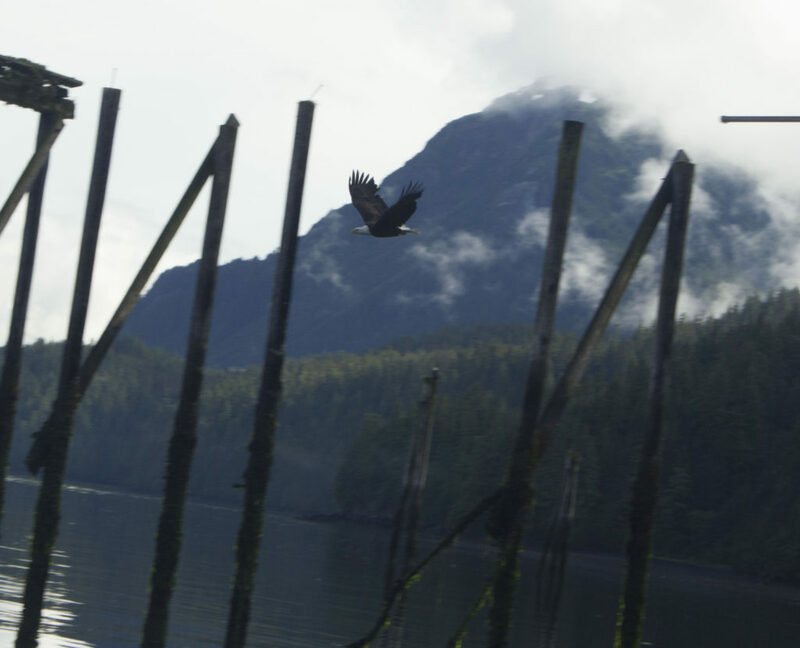 An eagle sitting on the remnants of the pier at the Orca Adventure Lodge. 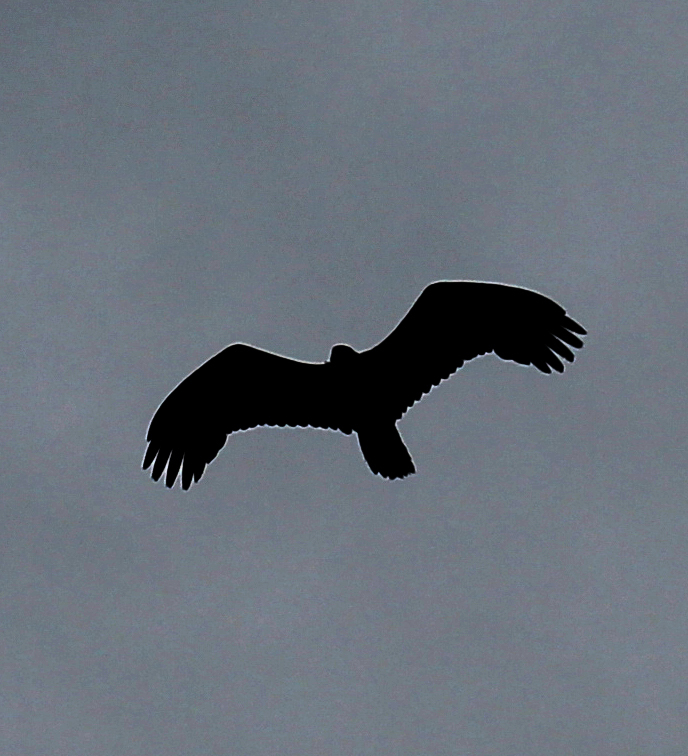 A flying eagle turns in the air. 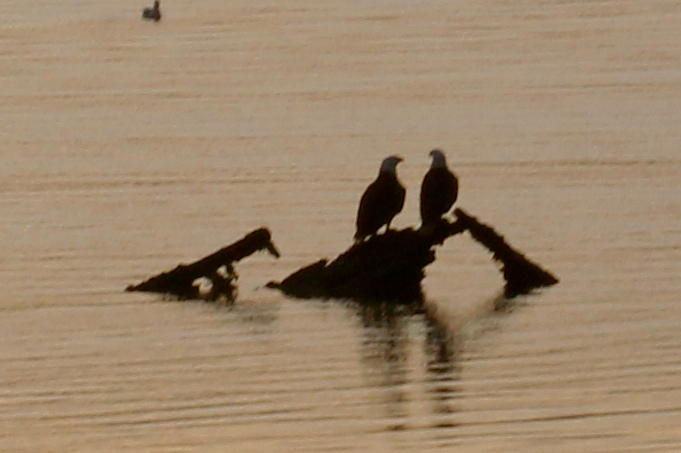 An eagle couple, sitting together as the sun descends behind the mountains. 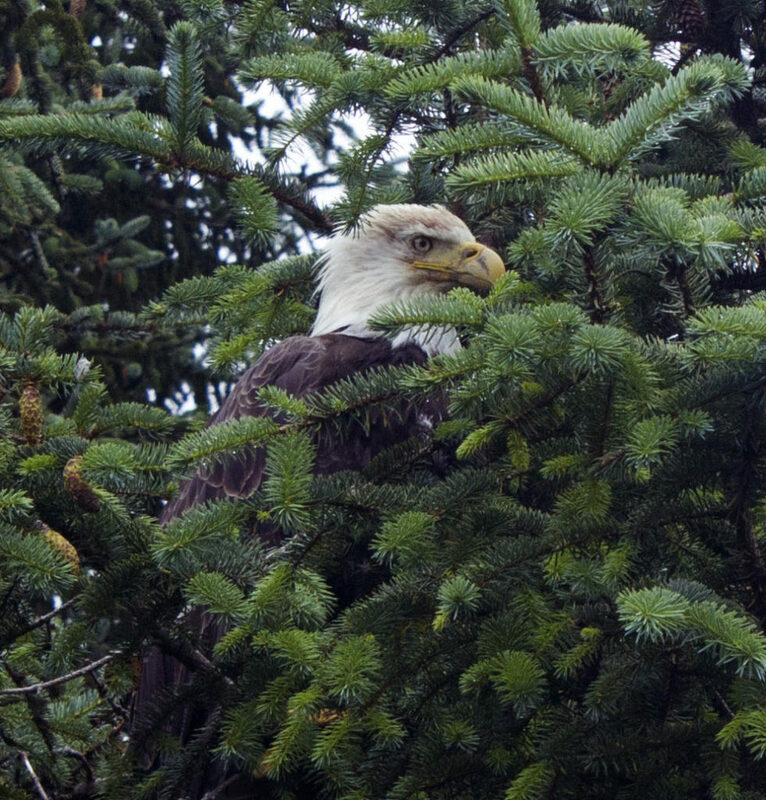 An eagle, his head bloodied from a previous meal, sits in a pine tree. 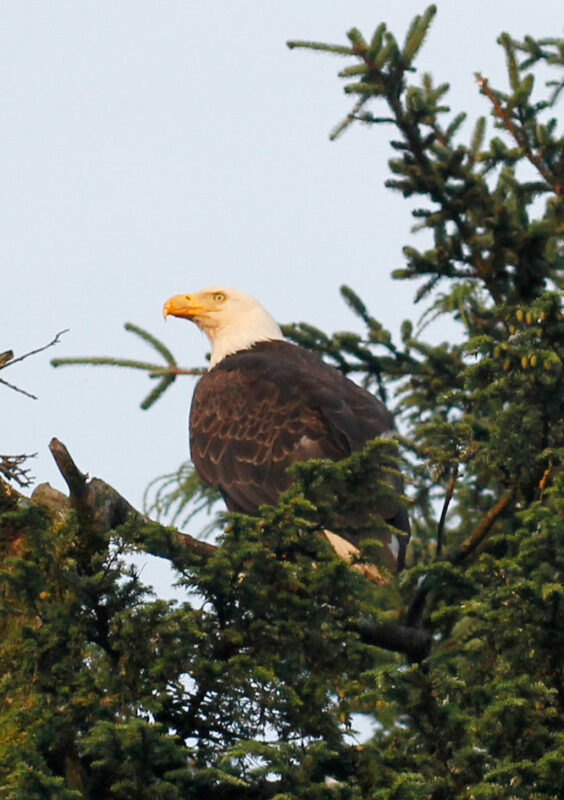 An eagle crouches in the trees. A eagle flies past the remnants of the piers. The injured eagle eating at sunset. 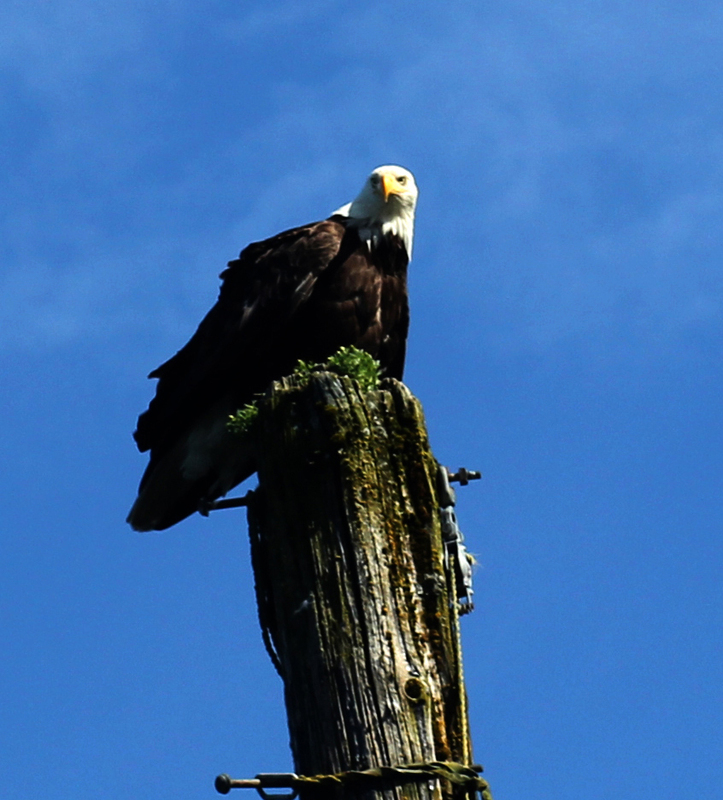 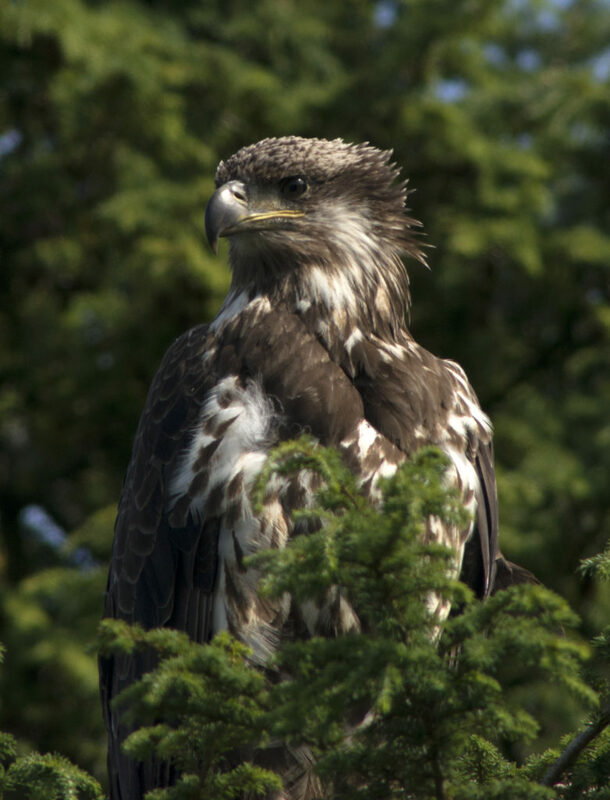 An adolescent eagle surveys the area before him. 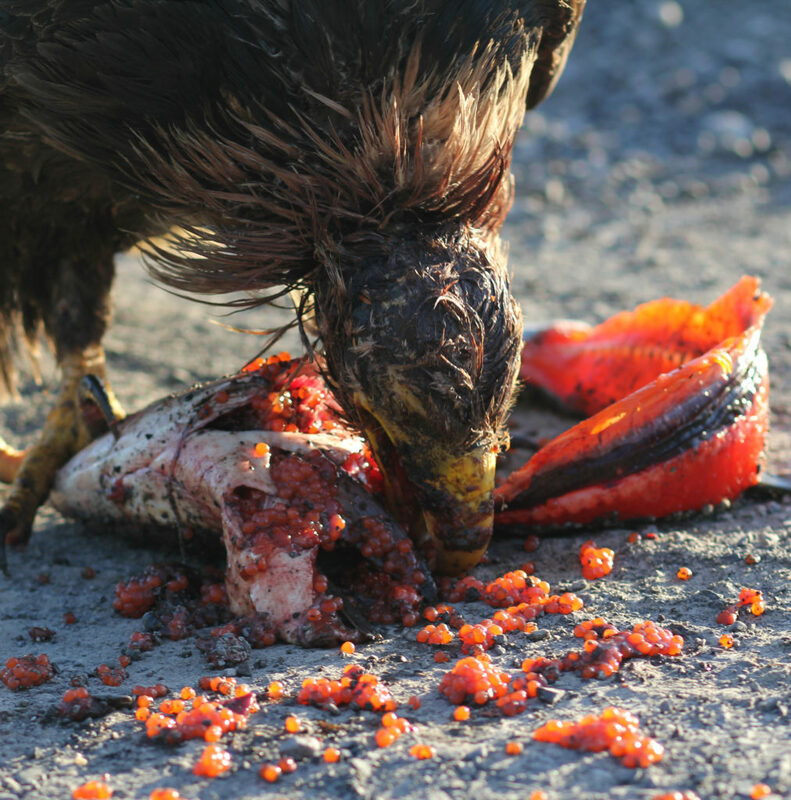 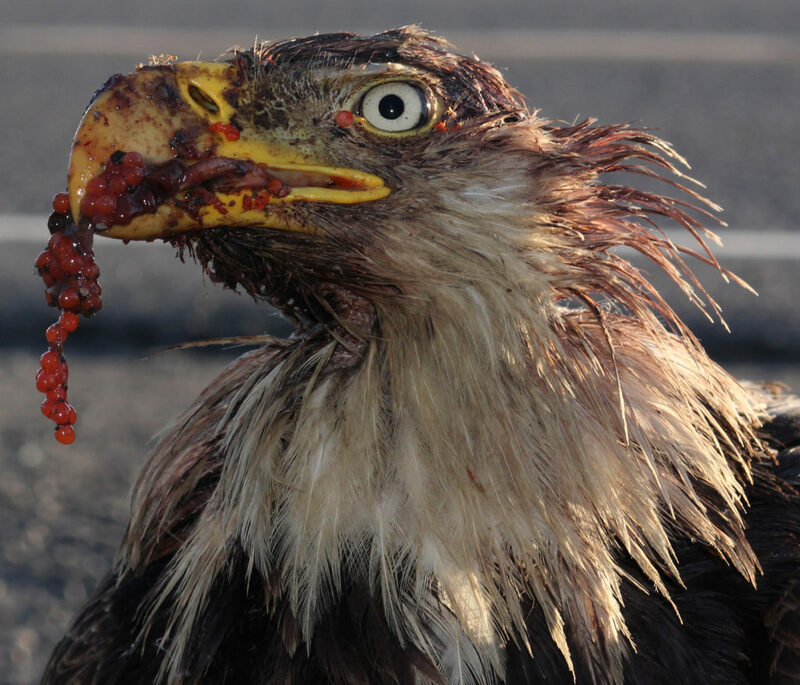 Proud and defiant, the injured eagle looks at the camera, fish eggs dripping from its bloodied beak. 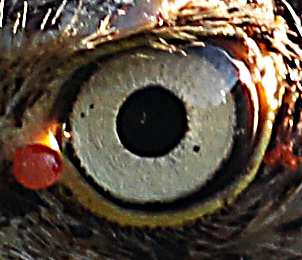 The eye of the injured eagle. 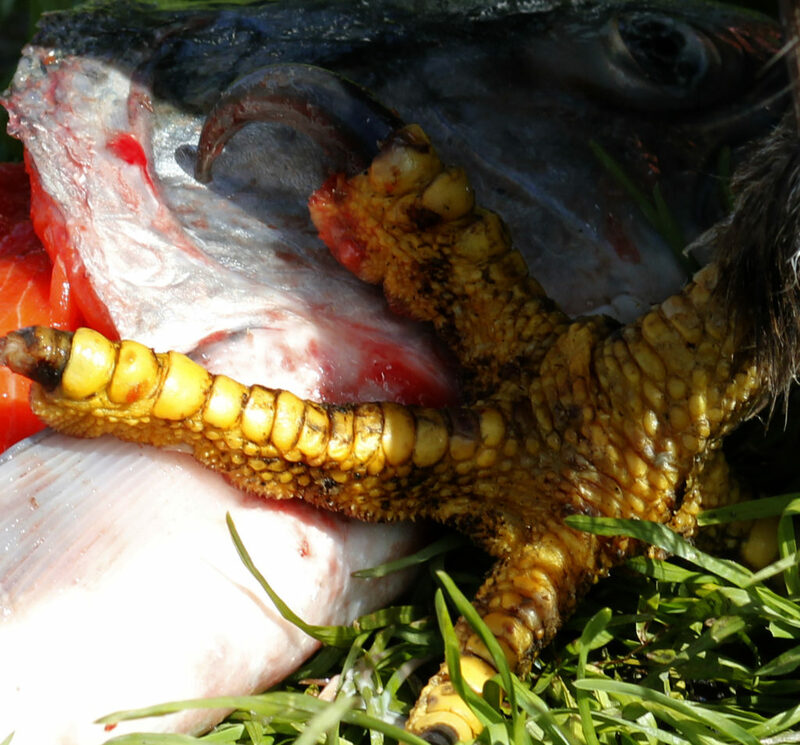 An injured eagle uses a talon to pry apart one of his last meals. 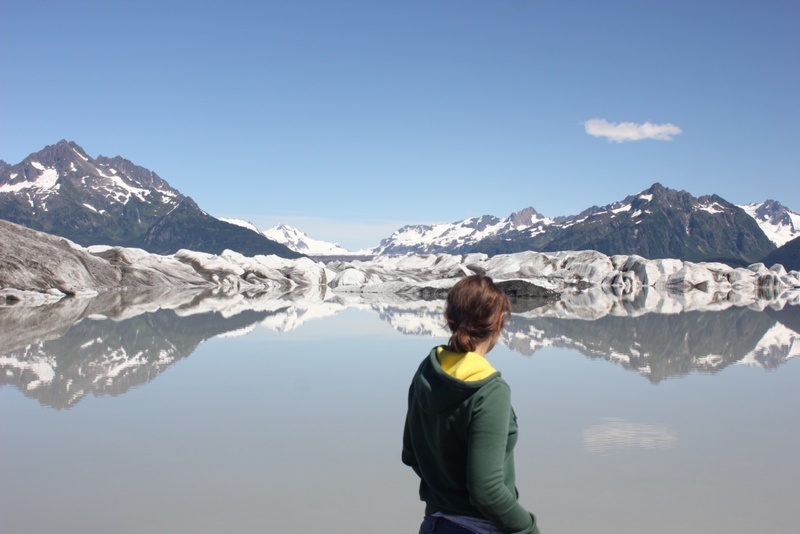 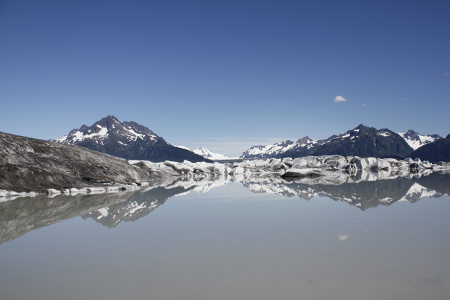 The landscape of the melted Sheridan Glacier. 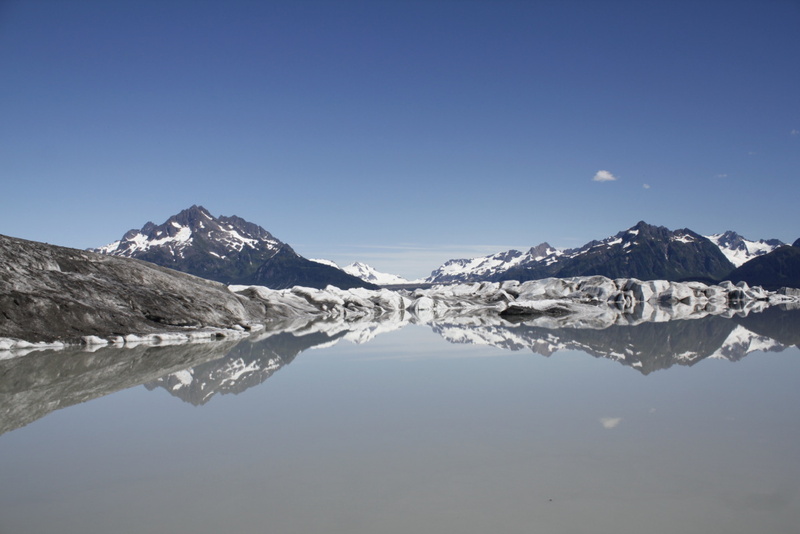 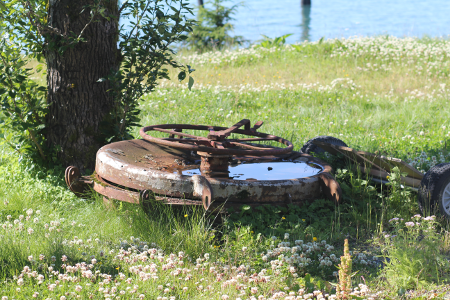 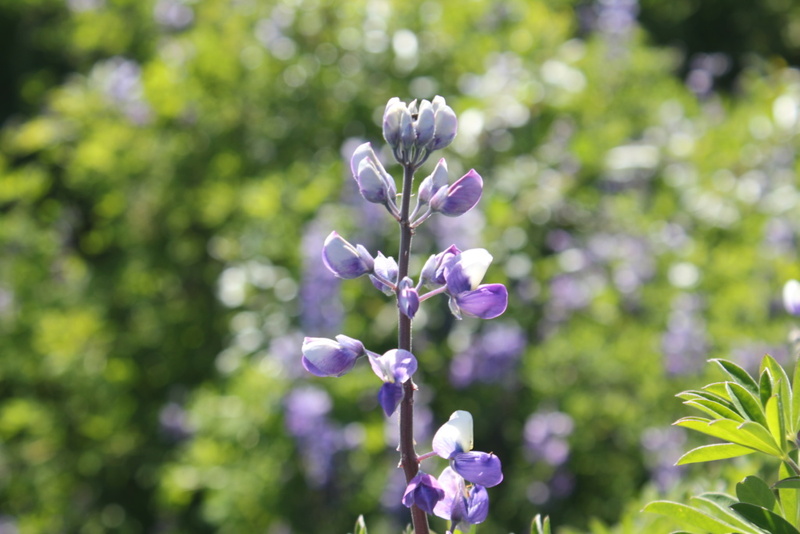 A flower, located on a hill at the base of the melted waters of the glacier. 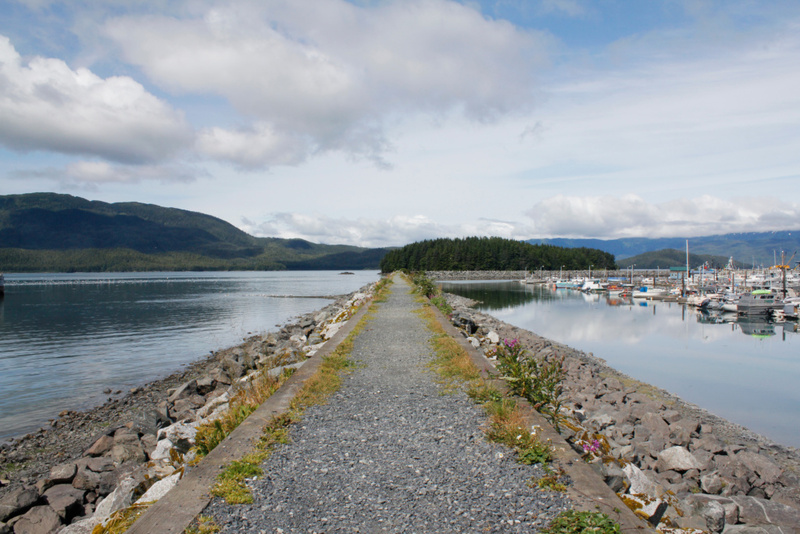 This pathway divides the boat harbor from the rest of the bay. 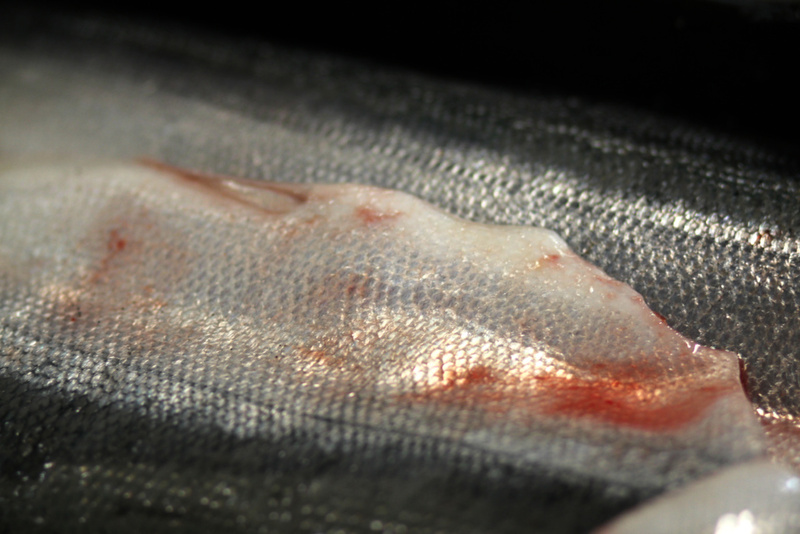 Water glistens on the surface of these freshly cleaned fish fillets. 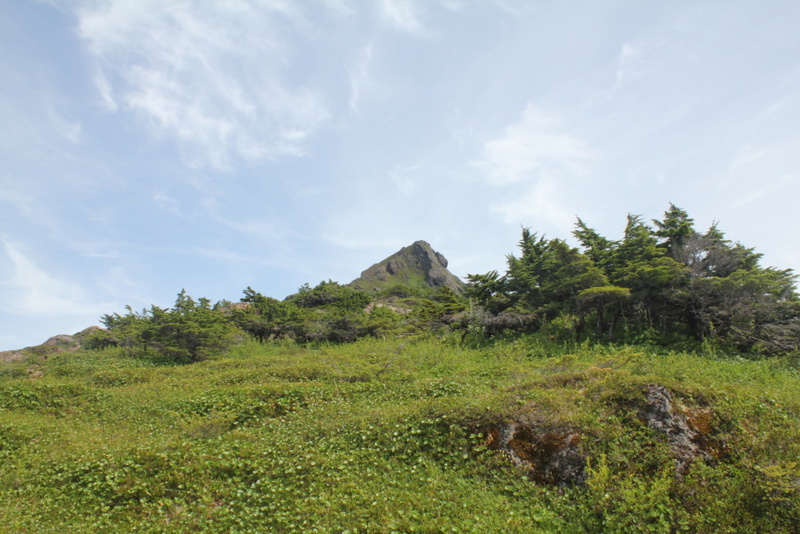 The peak of a mountain which overlooks Cordova's harbor. 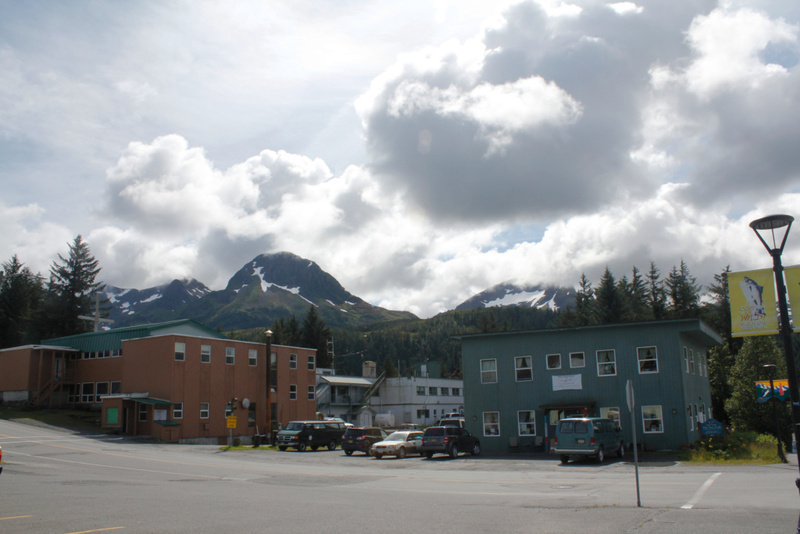 A cloudy sky and misty mountains overlook the downtown area of Cordova. 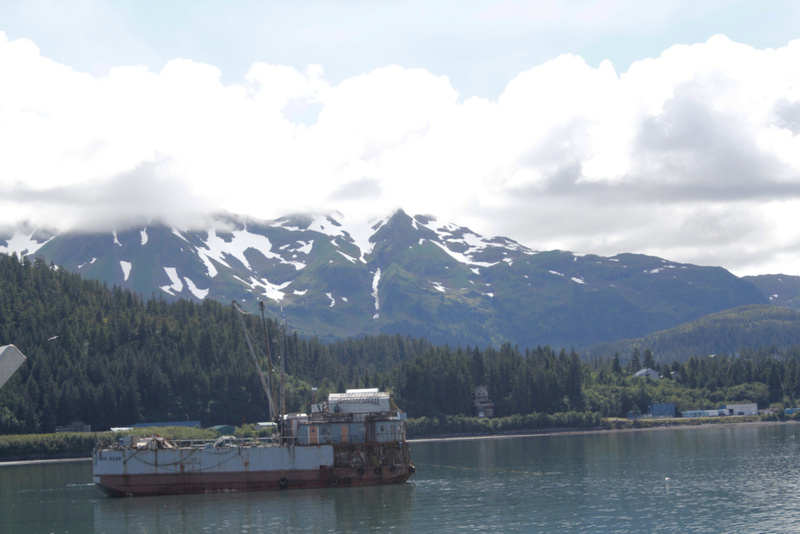 A boat outside of Cordova Harbor. 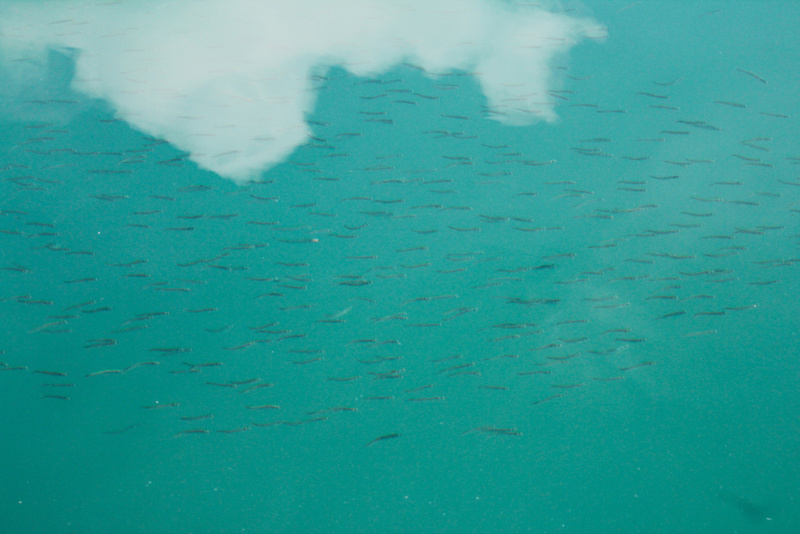 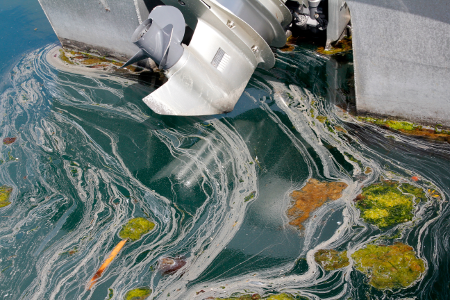 Guppies swim through the waters of Cordova's boat harbor. 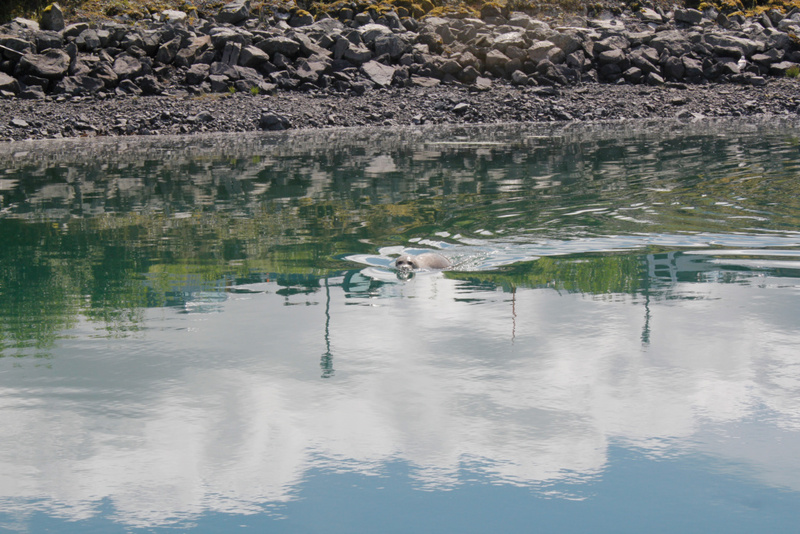 A seal plays hide and seek in the boat harbor. 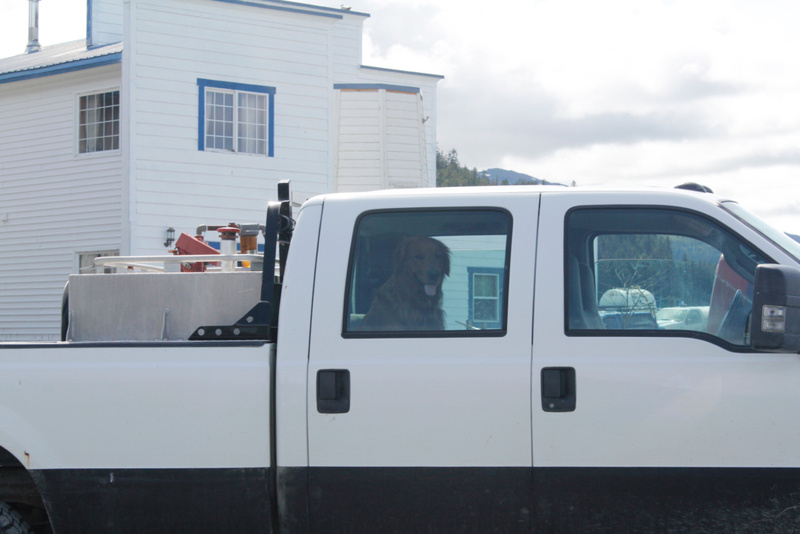 A smiling dog waits for the return of his owner. 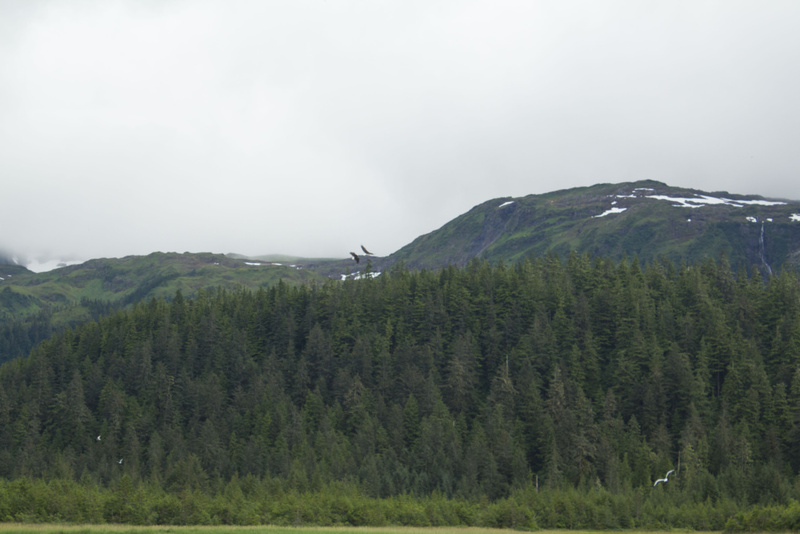 A pair of eagles, set against the backdrop of the misty mountains, dive over Hartney Bay. 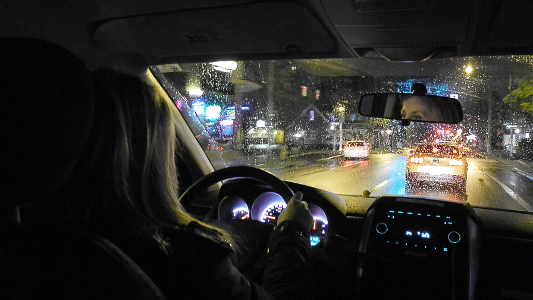 The driver smiles at a joke one of her coworkers makes. 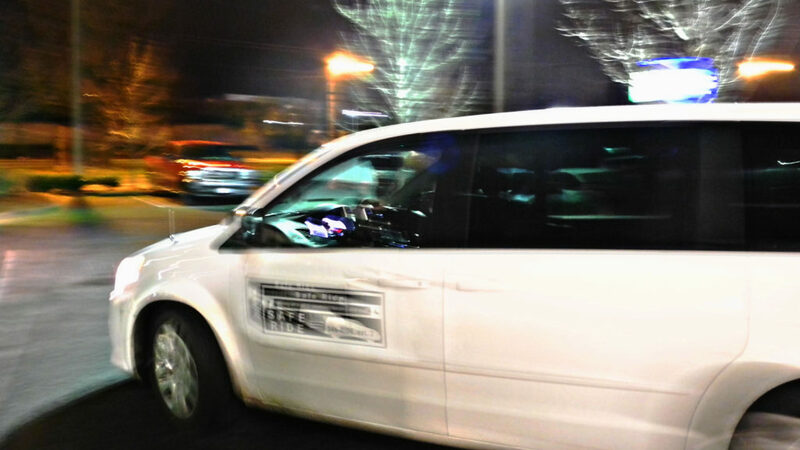 The van pulls off into the night, heading for its next pickup. 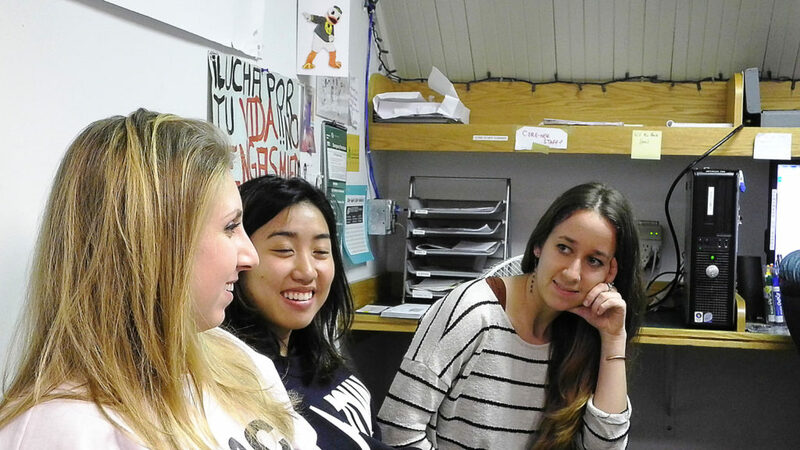 In between rides, the student workers at Safe Ride sit together and chat about their experiences. 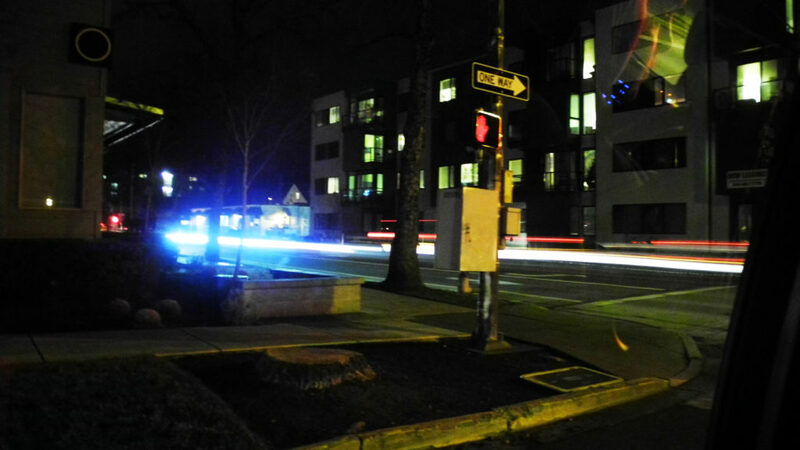 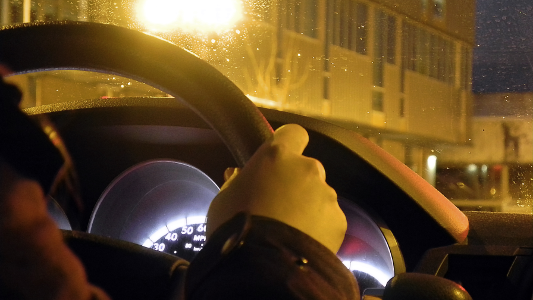 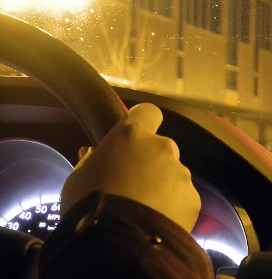 A car leaves a streak of light as it moves past.